Hundreds of designs are just a few clicks away. Select a link to the right to refine your search. 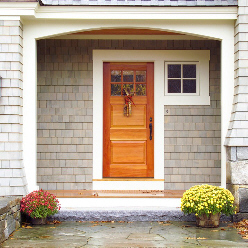 From simple to elaborate, each HeartWood door makes a statement that is unique. Whether on its own, with sidelites, transom, or both, we can create the look and function you require. All products manufactured by HeartWood are custom, so the photos and drawings contained in this site represent only a small sampling of our work. If you don't see the design you require, or would like to discuss more options, please contact us for a consultation.